Here’s a pic of the SUDAR low frequency calibration setup. SUDAR’s factory calibration is performed using two methods. First a tank calibration is done using a sound source and a reference receiver. The pulse method is used to avoid reflections. Unfortunately the test tank size constrains this to a minimum frequency of about 4kHz, below which the required pulse length becomes too short to get an accurate measure. 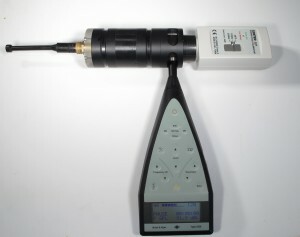 A Centre technology model 327 250Hz 94 dB sound calibrator is used for the sound source. This is coupled to the hydrophone with a custom coupler, which allows the addition of sound meter. I use a Bruel & Kjaer 2236 Class 1 sound meter to be certain that the hydrophone is subjected to the prescribed pressure. I’m in the process of getting a batch of the couplers made to make available for those that wish to do their own calibrations. These can be be used with most calibrators or piston phones with a 1″ port. I’ll make another post here once they arrive.